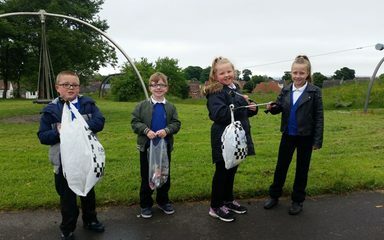 As part of Environmental Awareness Week, our rights respecting steering group members played their part in making sure that children can enjoy their right to a clean, safe environment – Article 24 on the Convention on the Rights of the Child – by going litter picking in Blackhill Park. We managed to fill three bags full of rubbish and the park was a much cleaner and more pleasant place to play when we had finished. What a fantastic effort! I just wish adults and children would take their litter home with them. Well done RRSA Steering Group! I hope subsequent visitors will follow your example.